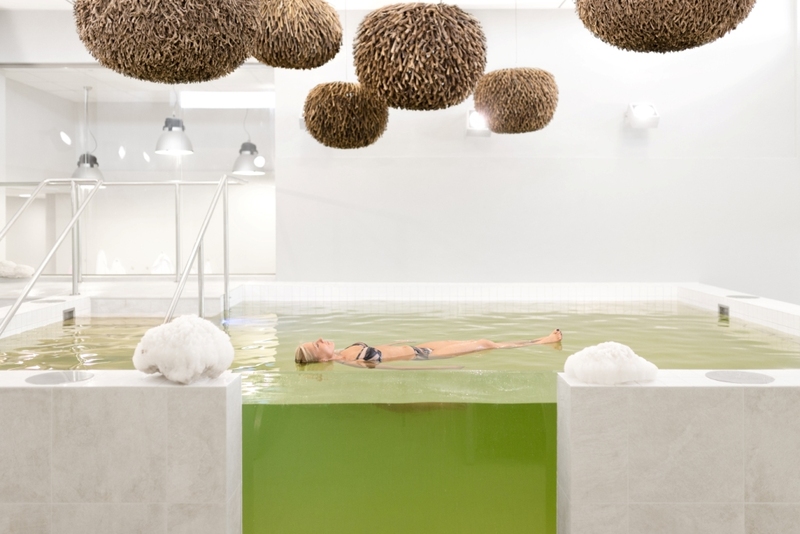 Dead Sea pool in the SPA & SAUNA center at ESTONIA Resort Hotel & Spa**** welcomes all guests who want to experience the feeling of floating in the Dead Sea. Similarly to the Dead Sea, the salinity of the Dead Sea Pool is 33%, which means that a human is able to float in the pool without any physical effort. Floating in the Dead Sea pool is one of the best relaxation therapies. The recommended length of one floating session is 15-25 minutes. After the session, we suggest relaxing in the reclining chairs, enjoy the center’s various saunas, and drink plenty of water. plus the entrance to the SPA & SAUN center depending on the weekday. No pre-reservation is needed, check opening times here. THE DEAD SEA is a continental salt lake located 400 m below sea level in the Jordan Valley surrounded by the Judaean Mountains in the West and the Moab Mountains in the East. The salinity of the lake is more than 30%. It is a three-million-year-old unique natural phenomenon which can also be called the world’s biggest spa. The Dead Sea has been known as the fountain of youth and health since ancient times. Dead Sea salt has a healing and restoring effect; it also helps prevent multiple illnesses. Sea salt calms nerves, stimulates metabolism, and is good for the cardiovascular system, joints, skin, and hair. Salt is a good choice for those who want to restore the smoothness of the skin and good hair growth, the flexibility of joints and the elasticity of muscles. The Dead Sea bath includes rejuvenating properties and strengthens the immune system. An evening bath also helps to fall asleep. Dead Sea salt is very efficient for curing skin problems like excessively dry, oily, or gentle skin. The Dead Sea is full of essential minerals, which have an important part in metabolism and in maintaining balanced, moisturized skin. Bromine helps tissues heal and acts as a natural antibiotic. Potassium, like sodium, helps cells absorb water and removes toxins from the body. Calcium is crucial for strengthening cell membranes and cleaning pores. It is also important for maintaining healthy and strong teeth and bones and for regulating the work of heart muscles and nerves. Sulfur is, among other things, necessary for metabolism and absorbing carbohydrates and vitamins. Magnesium is essential for heart muscles to be able to relax, helps alleviate depression in cases of fatigue and mental illness, strengthens teeth, prevents heart attack, alleviates sleeping problems, and prevents neck and back pain. Information: tel 440 1014, e-mail resort.spa@spaestonia.ee.